You will see: Dunes,Sand desert,Rocky desert,Atlas Mountains,Oasis,Salt lakes,"Star Wars” decorations,Mountain oasis,Cave houses,Ksurs,Berbers' villages. 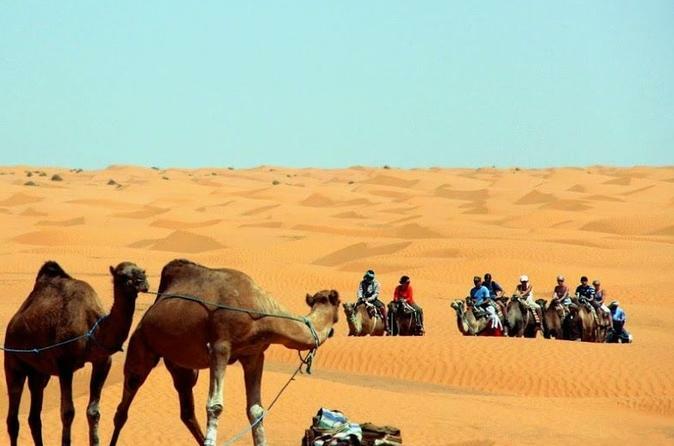 You will experience: Camel riding,Dune riding,Off road,Might in tent,Thermal pond swimming. You will see: Dunes, sand desert, rocky desert, Atlas Mountains, oasis, salt lakes, "Star Wars” decorations,mountain oasis, cave houses. You will experience: camel riding, dune riding, off road. You will meet: Berbers, Nomads, Touaregs and...our friendly staff. Small groups, unbeatable itinerary, a lot of fun!